I would presume this would be a branded Carphone Warehouse charger. Made by Carphone Warehouse, alongside SimplyTap, so unsure as to whether SimplyTap users are eligible for the offer. Obviously just a promotion to get people to use the App, but seems like a good deal if you need a spare charger for work or something. Delivered free and it says the offer is valid for a limited time whilst stocks last to new registrations only. The 1p smartphone charger offer is for new registrations only via the Carphone Warehouse Mobile Checkout app and cannot be used in conjunction with any other offer. The offer must be taken up within 5 days of initial registration on the app. The offer ends 7th October 2012. The offer is limited to one per customer for first time purchases only. 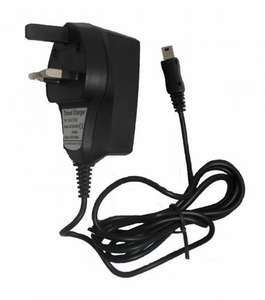 Chargers are compatible with iPhone 3, 3G, 4 and 4S or Android devices using micro USB port. The offer is strictly while stocks last. How the hell do you order one?! I can't see it....! Not out of stock you need to choose the iPhone or micro usb version in the drop down at the bottom of that page. It states my account details are incorrect when I try to purchase it for some reason although they are correct. What a load of rubbish. Mines the same,tried ordering several times and keeps saying my account details are incorrect but they arent! Surely that's understandable, you'd have to give your card details if you were purchasing from any website, be it Amazon, Play or Zavvi if you're shopping with them for the first time? It's obviously an offer to build up a database of customers and to get everyone talking about the new App. Seems reasonable? Ordered no probs, thank you! It states my account details are incorrect when I try to purchase it for … It states my account details are incorrect when I try to purchase it for some reason although they are correct. What a load of rubbish. Will the charger not work with the iPad? Thanks for really cryptic, useless message SimplyTap! Even at 1p for a charger, it seems such a headache to order, think I'd rather just buy them normally. Get the same problem as well...Thanks for really cryptic, useless message … Get the same problem as well...Thanks for really cryptic, useless message SimplyTap! Even at 1p for a charger, it seems such a headache to order, think I'd rather just buy them normally. Just deleted both apps (simplytap and carphonewarehouse simplytap). I bought that easter egg from Thorntons and that's it, could not buy anything else as it always gives me that "your account details are incorrect". It probably will but will be slow to charge. Done, thanks op great find. Good spot - App will be deleted once it arrives. When entering card details it appears to limit the card holder name to 15 characters! Rubbish. I tried continuing by missing my middle initial but the payment declined. I then got a phone call from HSBC and they've cancelled all my cards. Thanks Carphone Warehouse. Can it be used for the iPhone 3GS or even iPods? I don't see why not, but it doesn't mention it. Can it be used for the iPhone 3GS or iPods? I tried to order and got the usual "your account details are incorrect"
Mine went straight through, then deleted the app. Any way of deleting the account now? Brilliant find!! well worth the heat in HUKD!! hot like fire, ordered usb and iphone charger! Question: why are ppl rushing to delete the app afterwards?